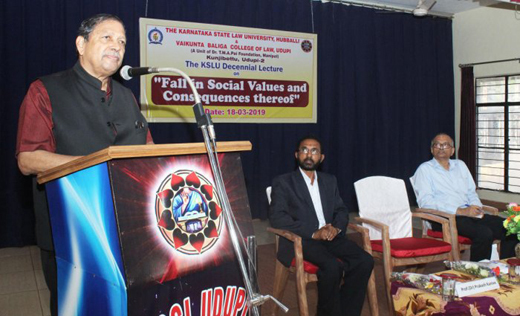 Mangaluru, Mar 20, 2019: Delivering a special lecture as a part of the decennial celebrations of the Karnataka State Law University at the Vaikunta Baliga Law College in Udupi, former Lokayukta Justice Santosh Hegde lamented that money power and position are handsomely rewarded in the society rather than humanity. Hegde said that the problem of illiteracy is looming large and is posing a threat to democracy. “According to a study conducted in 2009, out of more than 543 parliamentarians, those who spoke at least once were only 174 parliamentarians. The remaining were voiceless. If this is the case, why do we need representatives? Yet, these parliamentarians get underserved benefits at expense of tax payers, " he lamented. He also referred to the examples of the separation of Telangana and the cry for a separate North Karnataka state, which emerged after the chief minister’s baseless assertions. ‘Life in fantasy’ : He said that the reality is totally different as most of the time people are living in a fantasy world. “We have to live as one country with multiple religions, cultures and languages. Do not fall for and become victims for job-oriented incentives and divisions,” Hegde urged the youth. ‘Criminals rule ’ : Coming down heavily on the massive corruption taking place, the former Lokayukta said that corruption has been at the core of all affairs in the country. “It is sad that even people who are imprisoned for crime are welcomed with garlands,” he added. Hegde called upon the youth to come forward to fix the existing problems. “Values, moralities and humanities are the only way out for a healthier society,” he reminded. There was a very enthusiastic attendance.